The following essay was originally compiled for the Mixed Migration Review 2018 and has been reproduced here for wider access through this website’s readership. As government-imposed restrictions on migration push more would-be migrants into unauthorised channels, the vast illicit trade of smuggling people across borders is gaining ever more attention. The global revenue from this business is hard to quantify due to its clandestine nature, but there is evidence that in 2016 at least 2.5 million migrants were smuggled worldwide for an economic return of up to $7 billion. Others have estimated people smugglers make between $5 billion and $35 billion per year worldwide. Europol concluded in 2017 that migrant smuggling had emerged as one of the most profitable and widespread criminal activities for organised crime in the European Union. Classifying it as a large and sophisticated criminal market, Europol compares it to the European drug markets. This essay explores some of the dynamics and vested interests involved in the migrant industry, which has increasingly taken root around the world and is becoming increasingly entwined with local economies and societies. It also examines how lucrative the economy is and the political implications of its embedded nature, one that contributes to its robustness and resistance to external disruption. The link between restrictive migration or asylum policies and rising costs of smuggling is well documented. As governments raise physical and legal barriers, they drive a greater percentage of potential migrants into the hands of smugglers who are happy to increase the price to whatever their customers will pay. Along the Mexico-United States border, fees charged by smugglers to facilitate unregulated crossings reportedly increased by around 130 percent after the Trump administration began implementing stricter border controls. 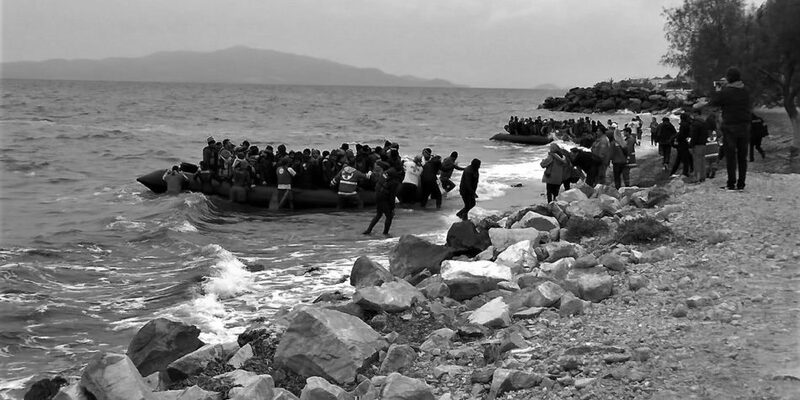 The clandestine, smuggler-managed migration routes to the European Union flourished in the past half-decade largely because the EU’s restrictive visa laws towards citizens of non-member states of the Organization for Economic Cooperation and Development (OECD) made legal entry channels into the EU unavailable to Syrians, Afghans and other people who needed protection and wanted to apply for asylum in Europe. In 2015, refugees and migrants were reportedly paying between 500 and 2,500 euros to make a sea journey of less than ten kilometres into the EU: from Ayvalik in Turkey to Lesbos in Greece. When the smuggling is conducted by sea, the profits of smugglers tend to be higher because their expenses and risk of being detected are relatively low, and because a larger number of people can be smuggled at once. However, this also clearly depends on the situation at sea. Off the coast of Libya, for example, the Italian rescue operation Mare Nostrum significantly changed the dynamics of Libyan migration and smuggling. Instead of arranging the 160-nautical-mile crossing from Libya to Italy, smugglers adapted to ferrying migrants only 12 nautical miles into international waters. This reduced logistical and operational costs, thereby removing a significant barrier to the Libyan smuggling market, opening it up to anyone who could buy a boat and gather migrants. That changed when Mare Nostrum was replaced by Triton, but by that time the smuggling market had enjoyed 11 months of unfettered profits and had become significantly more entrenched in the local political economy. Beyond the market dynamics of supply and demand and the means of transportation used, smuggling fees generally depend on many other variables, such as the distance to the desired destination, the age, gender, health and socio-economic profile condition of the refugee or migrant, and whether smugglers need to forge travel documents or bribe border officials. Havoscope, a global online black market information index, suggests prices for migrant smuggling are as high as $277,000 for journeys from India to the UK, $50,000 from China to the US, and $25,000 from Afghanistan to London. At the other end of the scale, reflecting the limited resources of most of their clients, a crossing from Somalia’s Puntland region to Djibouti has been quoted to cost as low as $50, with another $150 needed to pay smugglers to continue across the Bab el Mandeb strait to Yemen. Even at these lower rates, people smuggling can be a hugely profitable endeavour in these communities, and all the more attractive considering the limited alternative economic opportunities. 4Mi data analysis shows that young men in particular engage in smuggling precisely because it is more lucrative than other available forms of employment. Media reports often focus on individual “kingpins” running smuggling rings, overlooking the extensive role smuggling plays in some local economies and the number of people who are engaged in and making their living from smuggling and the “migration industry” in general. A smuggling business is usually made up of loosely-connected actors performing a range of different roles. Local enterprises such as transportation companies, hotels, restaurants, internet/call shops, and transporters are also part of and dependent on the migration business. A 2015 study showed that in the summer of 2015, an average of 100 vessels were crossing every day between Turkey and Greece. Based on the cost of a dinghy, the number of paying clients, and the fees smugglers had to pay to others in the smuggling chain, it was estimated smugglers made a profit of approximately $10,000 per trip. The smuggling business was therefore injecting up to $1 million per day into a number of Turkish towns from where these trips were organized, generating a degree of support for and complicity in the trade among local communities. Throughout the Horn of Africa, there are “thousands of lower level actors offering smuggling at varying levels, as well as community actors whose livelihoods depend on servicing the smuggling industry by providing food, shelter or other non-criminal acts”. In the Sahel region, “human smuggling has become an economic mainstay of significant elements of the population.” This embeddedness means that smuggling plays a role in economies at local, state and regional levels, particularly in places of origin and transit. International efforts to combat smuggling through criminalization of smugglers therefore has serious economic and political consequences. An interesting example of the socio-economic impact of smuggler criminalization has been taking place in the Nigerien city of Agadez, which has been the focus of the EU’s anti-smuggling efforts since 2015. The refugee and migrant smuggling economy of Agadez, a city that has long been a transit hub for people and goods, started growing in the early 2000s. In subsequent years, as an estimated 100,000 people per year passed through the city on their way to Libya, the migration industry there became a significant source of employment and income.35 “Each smuggler supports a hundred families,” the president of the Agadez Regional Council told a reporter. Everything changed in 2015 when Nigerien officials passed an anti-smuggling law that effectively criminalized the transport of migrants. The law was passed under intense pressure from the European Union, which offered Niger aid and development assistance in exchange for “breaking the business model of smugglers.” Since Nigerien authorities began enforcing the law the number of migrants passing through checkpoints significantly decreased, and at least 6,000 people have reportedly lost their livelihoods, including smugglers, shop-owners, landlords, restaurateurs, vehicle mechanics, and merchants who benefitted from the migrant economy. The criminalization of smugglers thus significantly impacts the entire region’s economy, leaving “young men vulnerable to recruitment of jihadi groups” such as Boko Haram and Al Qaeda in the Islamic Maghreb that are making inroads in economically disenfranchised communities to expand their presence in the region. Libya provides another example of the complexity of political and economic dynamics related to migrant smuggling. Since 2015, smuggling operations in Libya have developed into much better organised networks and transnational consortia “able to handle routes and volumes of people requiring substantial logistical and financial capacity”. The fragmentation of power structures in Libya and the collapse of the country’s economy have also increased the risk of smuggling becoming endemic, fuelling other criminal activities such as weapons and drug trafficking. Already in 2014, the United States Institute of Peace warned that organised criminal behaviour, illicit trafficking and trade, and the armed groups that engage in them were harming the transition at a time when consolidating institutions of statehood was critical. In 2016, a report by Sahan and IGAD concluded that the revenue generated from migrant smuggling by the multitude of armed groups in Libya that control key border crossings was among the threats to the country’s stability. Adding a new twist to this volatile situation, in 2017, in an effort to reduce migration flows along the central Mediterranean route, Italy embarked on negotiations with Libya’s competing governments and engaged with tribes from the south of the country as well as several urban militia groups. As a likely result, in August of that year, hitherto brisk migrant-smuggling flows along the shores of Zawiya, west of Tripoli, came to a standstill. According to some observers, armed groups were receiving payoffs to stop smugglers’ boats leaving Libya in the form of aid, aircraft hangars, and large sums of money. Reportedly, a local group that collaborated with smuggling networks changed sides and started assisting Libyan agencies in stopping migration, illustrating the opportunistic character of those engaging in smuggling and the mercurial roots of the smuggling industry. But in the absence of viable economic alternatives, paying some of these groups to stop migrant smuggling is unlikely to be a sustainable approach. It also risks disrupting fragile local power balances and empowering actors who may not see any dividends in stabilizing the country. Although it is clear that migrant smuggling is closely entwined with local economies and societies, little is known about where exactly the colossal proceeds from migrant smuggling go, how they are laundered, and how they relate to other economic sectors. In 2015, for example, less than 10 percent of Europol investigations into migrant smuggling activities produced intelligence on suspicious transactions or money laundering activities. In West Africa, OECD found that the economy around migrant smuggling was largely cash-based, which made it harder to track resulting illicit financial flows. However, according to the same OECD study, as more international networks to such flows are formed, the capacity to identify and seize assets related to migrant smuggling could grow. In a 2015 paper, the United Nations Office on Drugs and Crime confirmed that migrant smugglers in Europe often use cash-intensive businesses (such as money service businesses and cash couriers) front companies, and investments in assets such as cars and real estate, to launder their proceeds. In the US, smugglers use casinos, import/export firms and other cash-intensive businesses such as car dealerships, and transmit funds via wire transfers and online payments. In Asia, smugglers’ proceeds are often mixed with legitimate business profits and transferred via formal and informal banking systems. In Africa, buying real estate, investing in clubs and restaurants, offshore investments, and use of agents to carry cash are common. These findings tally with those of the inter-governmental Financial Action Task Force, which found several indicators of money laundering arising from migrant smuggling and human trafficking. These included: extensive use of cash; frequent transfers through money remitters to common recipients, often in high-risk countries; use of bank accounts with frequently repeated cash payments in and out of the account; use of front companies; use of “straw” persons; use of cash to invest in real estate/high value goods; repayments of loans or other debt burdens; the laundering of cash through casinos, import/export trades etc; and the use of the hawala or other informal banking systems. It is becoming increasingly clear how complex and murky the economics of migrant smuggling are, all the more so as its pickings are proving too rich for other criminal elements to pass up: in 2017 Europol reported that many organized crime groups in Europe had expanded their portfolios to include sector with a seemingly bottomless market: migrant smuggling. The report cited the December 2016 arrest of a major Moroccan drug kingpin as part of an investigation into transnational organised crime networks’ involvement large-scale drug trafficking in the Mediterranean Sea; the probe exposed concrete and recurrent links between migrant smuggling and cocaine trafficking. In addition to the economic embeddedness discussed above, another layer of complexity — and another challenge for those working to eliminate migrant smuggling — comes in the form of local actors in origin and transit states who have vested interests in many aspects of the business. These include state officials who facilitate irregular migration to varying degrees, from turning a blind eye for a small fee to active involvement in migrant smuggling, thus gaining a significant percentage of the smuggling revenue. A third of the more than 10,000 refugees and migrants interviewed by 4Mi reported having paid a bribe directly to a government official. Most of them used smugglers, and it can be safely assumed part of the smuggling revenue found its way back to certain state officials. Elimination efforts may also meet resistance from governments in countries of origin, which, because remittance flows from successful migrants form an important source income, are likely to have an interest in continued irregular migration for as long as legal channels remain limited. In the light of these webs of complexity, and when refugees and migrants pay billions to smugglers, and destination countries pay billions to keep them out, it’s worth asking, are there not economically smarter ways to organize migration? One interesting idea, applying a purely economic and market-based approach, was proposed in a 2016 policy paper by the Centre for Global Development. The authors proposed a system of selling visas, so that migrants could reach their destinations legally, instead of having irregular migrants fuelling smugglers and the underground economy. Though only one example, this shows how applying an economic perspective to migrant smuggling may offer new and innovative solutions. If governments only seek to restrict migration and asylum arrivals, lucrative business opportunities will continue to be available for smugglers and their associates. Without more comprehensive approaches towards migration — combining alternative legal migration channels with increased resettlement of refugees and greater availability of work visas for temporary labour — the low-risk, high-return trade of refugee and migrant smuggling is likely to continue to prosper. Andersson, R. (2014) ‘Illegality, Inc. Clandestine Migration and the Business of Bordering Europe’ University of California Press.